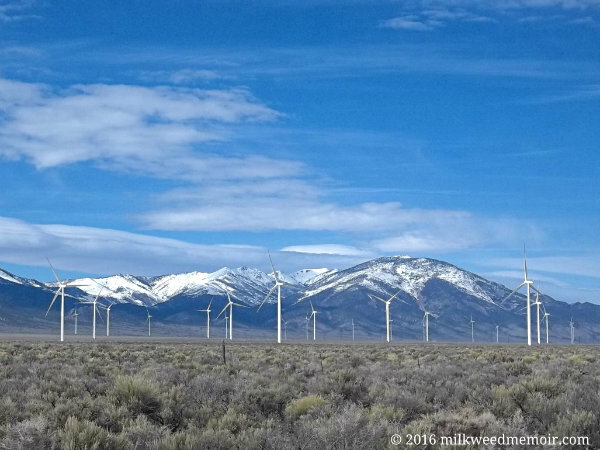 Pattern Energy’s Spring Valley Wind Farm, on BLM land at the intersection of US 50 and 93, is Nevada’s first wind-generated electricity production facility. The 152 MW facility comprises 66 2.3 MW Siemens turbines. It began commercial operation August 2012. That’s pretty much all there is to tell. But I had to snap a photo. Not only is it a gorgeous location, but every time I see windmills on a ridge, a concentrated solar power (CSP) plant, or any kind of alternative energy facility, it fills me with hope. Yet even while all this controversy continues, alternative energy is springing up all over the country. In my travels, I not only see the large facilities, but I see ranches and farms with their own alternative energy power. I see more suburban houses with photovoltaic panels on the roof. There is more and more of the right technology. I don’t have the eagleeye view on whether this is enough to curb the worst outcomes of Global Warming, but it gives me hope. And it makes me proud to be an American. Just how many kinds of candies and nuts are sold at Death Valley Nut and Candy Co., inside Eddie World, the mega-roadstop in Beatty, Nev.? That’s the question I asked the clerk (Melanie?) as I was checking out with my goods. But I needed a more scientific answer, so I did a proper sampling of the bins (counting, not tasting) , then extrapolated by the number of rows. My answer? 376. 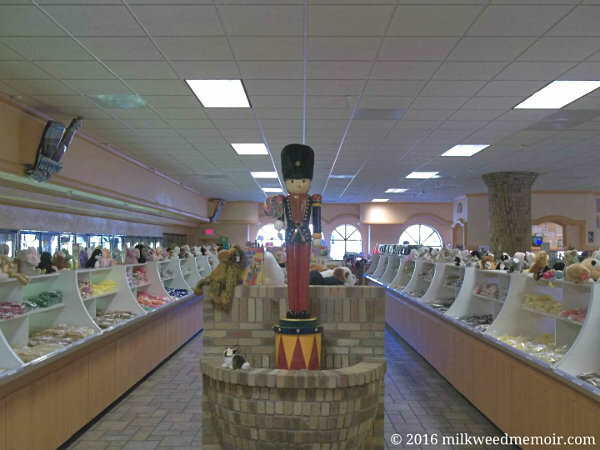 “We have regular, salt-free, sugar-free, everything,” said the clerk. I can well believe it. All goodies are sold in the same size bag, maybe a quart. (No buying a mouthful from the bulk bin.) And in those bags they have chocolate- and yogurt-covered confections, hard candies, gummies, nuts, dried fruit, and just about everything else you’d want in a snack. And that doesn’t even include your standard gas station candy and drink selection. But wait! There’s more! Death Valley Nut and Candy Co. is just one part of Eddie World! In the same convenience store building, they have an ice cream counter, Jed’s Fresh Jerky (free samples! ), and a Subway. They also sell toys and all your touristy books, postcards, and keepsakes. Sheetz, eat your heart out! Across from the convenience store and gas pumps, Eddie World includes the Stagecoach Hotel and Casino, which also has a Denny’s inside. On the other side of the convenience store is a Motel 6. It’s just about everything you need from a small-town Nevada reststop – except a brothel. 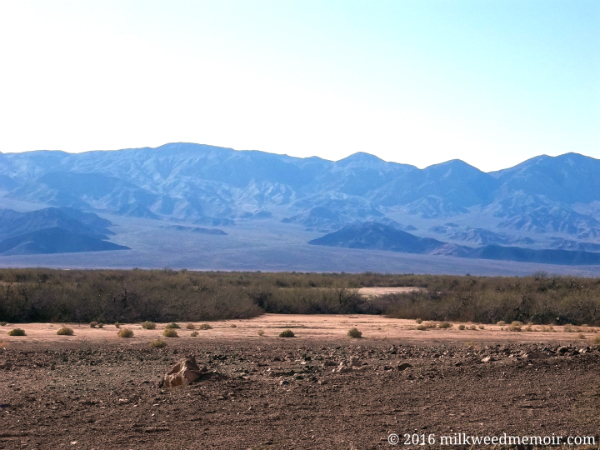 On the so-called “Death Valley” floor is the treasure that kept Timbisha Shoshone here for over a millennium – an oasis with honey mesquite groves. Didn’t know that Native Americans lived in Death Valley and are still living here? Neither did I until I arrived a few days ago. They’ve managed to thrive in the harsh conditions and outlast mining companies and efforts by the U.S. government to kick them out for centuries. And it’s all because of their close relationship with the land. "The Timbisha people have lived in our homeland forever and we will live here forever. We were taught that we don't end. We are part of our homeland and it is part of us. We are people of the land. We don't break away from what is part of us," wrote tribal elder and former Tribal Council Chairperson Pauline Esteves. The practical root of that endurance has always been the Timbisha relationship to the mesquite groves. Old-school anthropologists would probably have described the Timbisha as hunter-gatherers. But that is a weak understanding. They managed – and still manage – the honey mesquites as an orchard. To maintain their orchards, they pull out competing plants, coppice trees for lush foliage and renewable wood, prune dead branches, etc. As Charles C. Mann emphasized again and again in his wonderful book, "1491: New Revelations of the Americas Before Columbus ," Native Americans were far, far more technically sophisticated and “civilized” than Eurocentric mythology (née history) every allowed. In olden times, the valley’s honey mesquite was the foundation of their diet and a valuable trade item. Today, it’s still a part of their diet and a source of pride. Unfortunately, competition for water from Death Valley National Park’s tourism facilities and introduced palm and tamarisk trees has threatened the groves. But a few years ago, the Timbisha started the Mesquite Traditional Use Pilot Project in cooperation with the National Park Service to compare mesquite health in traditional managed orchard plots vs. a control of unmanaged plots. I’d like to find out how the project is going. If successful, Timbisha knowledge could be a windfall for permaculturists, gardeners, preppers, and others interested in using mesquite as a food source again. I mean, the Southwest is covered in mesquite, yet poor folks go hungry! In Texas, they call it “range weed”! I’m going to contact the tribe and see what I can learn. 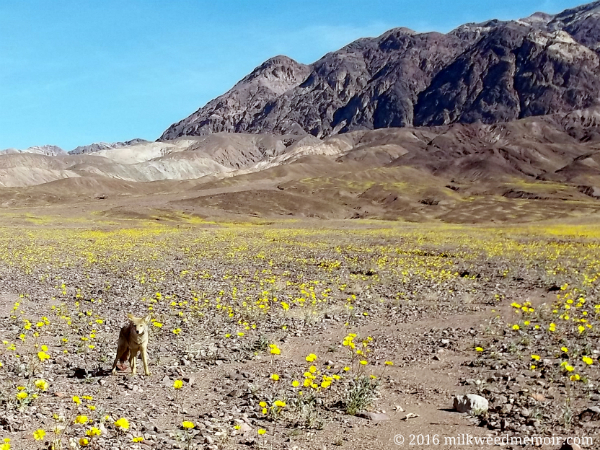 This particular golden-haired fellow was among the super bloom of desert gold and other flowers along Badwater Road. I stopped and he (or she) didn’t run off. El Coyote watched me watching him, in no hurry to leave. Perhaps he’s grown accustomed to humans? That would explain why I saw another coyote (or El Coyote?) the next day walking into the Timbisha Shoshone village in Furnace Creek (Death Valley Indian Community). In broad daylight. By the main road. Unhurried. Looking at me. Until I overheard something unnerving. Standing in line to order an Indian Taco, I was behind two Shoshone ladies from another, related band visiting the park. They were talking to the Timbisha woman behind the counter. The older visitor mentioned seeing the coyote walking into the village and said it was bad luck. The Timbisha woman agreed, saying it was a warning. Before she took their orders, though, she re-emphasized: El Coyote was a warning. But about what? And for whom…? Now, Learn a Bit of Shoshone! No, this isn’t Mars and it isn't science fiction. 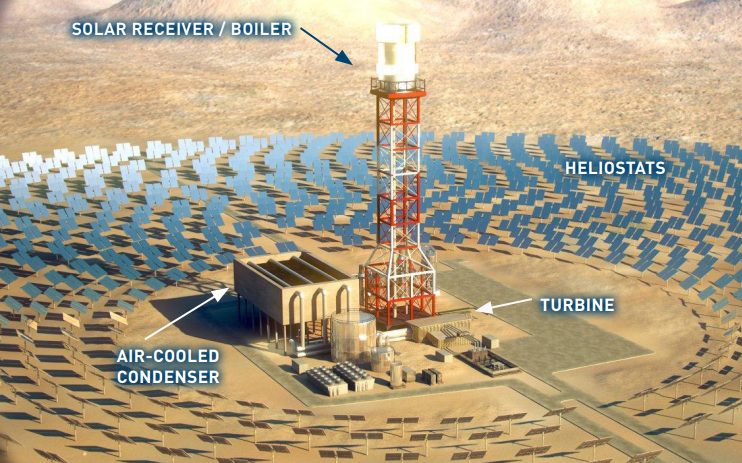 It’s the Ivanpah Concentrated Solar Power (CSP) facility – the largest CSP plant in the world to date. It’s in the Mojave desert in Nipton, Calif., close to where I-15 crosses the California-Nevada border. Basically what you’re looking at are three fields of “heliostats” (curved mirrors), reflecting and concentrating the sun’s rays onto their respective solar receiving towers. The tops of these towers get so hot that they glow white! All that heat is transformed into superheated steam, which runs electrical-generating turbines, just like a traditional power plant. To give you sense of it’s size, I took the somewhat blurry photo above from more than 15 miles (24 km) away. The facility covers about 3,500 acres (14.2 km2), and the towers are about 459 ft. (140 m) tall. BrightSource Energy's 392 MW Ivanpah plant by came online in 2014 to much hooplah, but it’s had it’s problems and detractors. First, it was incredibly expensive: $2.2 billion. Of that, $1.6 billion came from a loan guaranteed by the U.S. government. After all that money, it only produced 40% of the predicted electricity in its first year of operation. Some people consider it a boondoggle. But by the first quarter of 2015, they’d increased output by 170%. To run Ivanpah, though, it takes a lot of natural gas. … Gas? But I thought it’s solar, you say? Apparently, they have to preheat the water every morning. During that time, their CO2 output is twice what California energy standards normally allow for the amount of fuel they’re burning. The state gave the plant a special dispensation. On balance, however, that natural gas only would have produced 124,000 MWh of electricity in a conventional plant, compared to 524,000 MWh at Ivanpah, a more than fourfold increase in efficiency. The other ongoing concern is the perhaps hundreds of thousands of birds killed yearly by the concentrated solar rays. They’re just fried up in the sky. The power company is working on ways to keep the birds away. Hopefully they’ll succeed in reducing those deaths. I consider, though, as sad as it is, that many, many more birds will die if we don’t get ahead of global warming. It’s a calculated sacrifice. I feel the same way about windmills. Mind you, I think we ought fund a bunch of ornithologists to find a solution! I’ve never camped at the Bedrock City theme park, but I wish I had when my stepkids were little. Can you believe there are two of these places? It’s true! This one is in Williams, Ariz, at highways 64 and 180, south of Grand Canyon National Park. 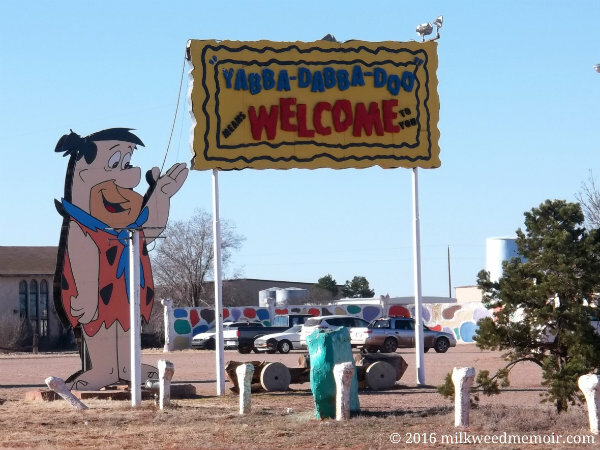 The other Bedrock City is in Custer, S.D. But now that I think about it, do kids even watch “The Flintstones” anymore? When I was a kid, that was one of the few, steady showings on my half-dozen channels. When my stepkids were little, they watched Nickelodeon and Cartoon Network via cable TV. Nowadays, how many kids stick with Internet? I don’t know. I’m outta the daddy loop these days. One thing stays the same, though: They all love cartoon animals. Now for your viewing pleasure, the beautiful Grace Helbig and Mamrie Hart star in “Babes in Bedrock,” a slightly snarky video filmed at the Bedrock City in Williams, Ariz. The Grand Canyon’s immensity can’t be captured in photos. Maybe an IMAX movie could do it. But this photo from Navajo Point along Grand Canyon National Park’s South Rim is my best attempt. 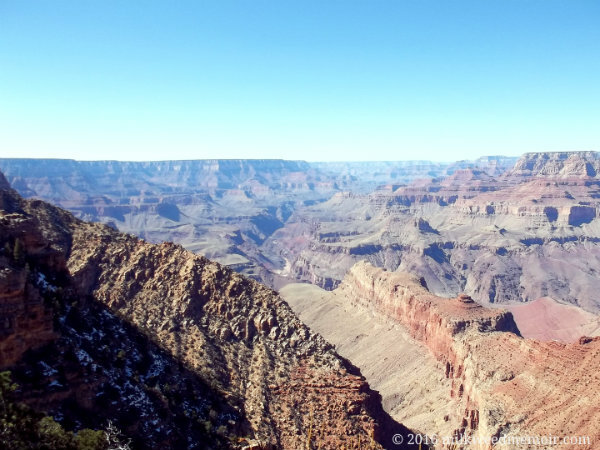 The scale of the Grand Canyon – really, all of the American West – can’t be contained. It must be felt in person. Out West, you realize how small you are and how large the Earth and Universe. The mountains, valleys, and plains go on beyond vision, and the stars are crisp and infinite. And yet here in the West, especially in the desert, I feel most whole and meaningful, most at peace. This is my spiritual home. At this spot, Navajo Point, I left a seed ball for Liz. Yet it wasn’t her I missed this day; it was my father, John Allen Freer. He always wanted to see the Grand Canyon, but he never made it out. He died at only 40 from Type I diabetes, which he’d had since 5 years old. Many times on this journey, I’ve thought of him. He, more than anyone else I know, would have appreciated this trip. I wish we could have shared it. I was only 14 when he died; I hardly knew him. The Grand Canyon calls to me. I want to go down inside and wander alone, maybe never to emerge. Here’s a video about a people who did just that, the Havasupai, who’ve lived in the canyon for at least 800 years.